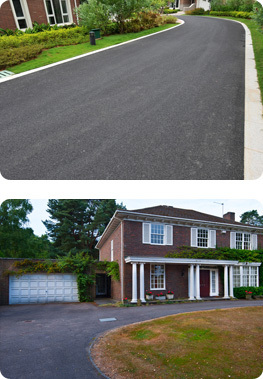 Tarmac driveway resurfacing company in St Albans, Hertfordshire. At J&M Pavers Ltd we specialise in installing top quality driveways, patios and paths. Tarmac has become a popular choice due to its durability and the availability of colours. As standard we offer red and black but more colours are available upon request. Preparation is the key to installing a long lasting, high quality durable tarmac driveway. Our experts at J&M Pavers Ltd will ensure the surface is clean, to avoid the surface from developing cracks. At J&M Pavers Ltd, we know through experience that when laid properly, Tarmac driveways can last for many years providing durability and exceptional value for money. Ask our experts about our cleaning and restoration service for broken or cracked tarmac..